Tension in the relationship between Belarus and Russia has remained in the shadow of the more visible discord between Russia and Ukraine, stemming from the latter’s now-spoiled efforts to sign an Association Agreement with the EU at the Eastern Partnership Summit in Vilnius in November. The quarrel between Belarus and Russia arose from a bout of assertive behavior on the part of Belarusian President Alexander Lukashenko. 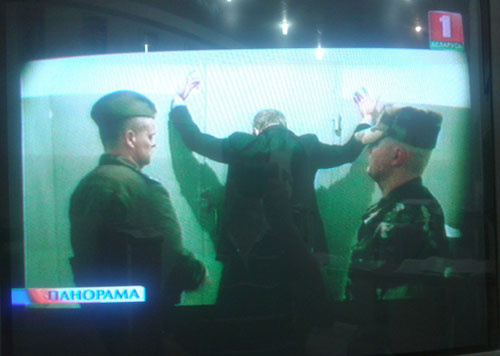 For those who assume Lukashenko long lost his freedom of action vis-à-vis Moscow, this was an unusual turn of events. Yet it is easy to explain. Lukashenko perceived an opportunity to exploit his status as Russia’s most valuable ally to increase economic subsidies, a necessity for securing reelection in 2015. Given Russia’s strong and publicly declared interest to rapidly proceed toward the creation of the Eurasian Economic Union, Lukashenko’s gambit is likely to succeed. 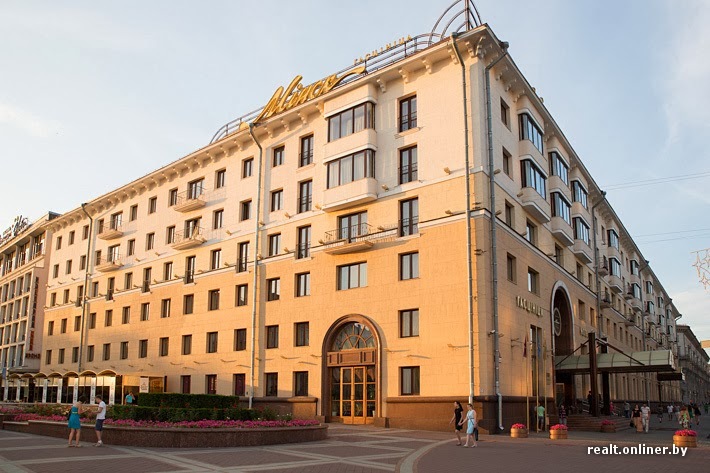 We continue our series of publications devoted to Minsk «star» hotels. 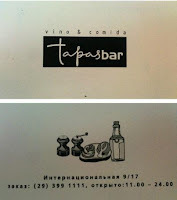 As a reminder, the correspondent of Onliner.by stays at the hotels as a "mystery guest" and shares his impressions. 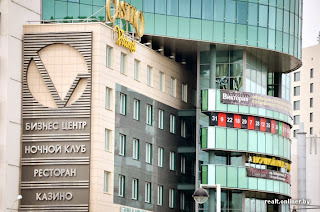 "Minsk" and "Victoria" were the first hotels which took up the challenge. 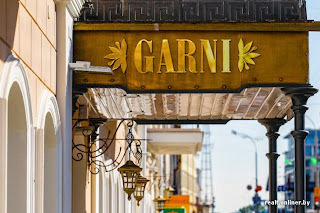 Now we will find out what level of service is provided in the three-star hotel "Garni". 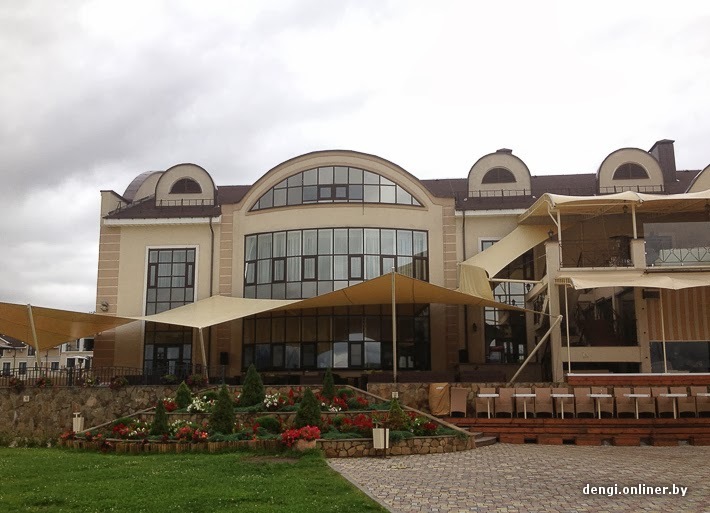 Later you can assess "Yubileinaya", "Crowne Plaza", "Europe" and "President-Hotel". This is the second part of "Top 200 Belarusian businessmen in 2013" ranking which includes persons placed on positions from 101 to 150. Robinson Club, a luxury country club and restaurant was opened in 2012. Located on Minsk Sea shore it gives visitors a wonderful opportunity to see beautiful Belarusian nature. But how about having a lunch there? 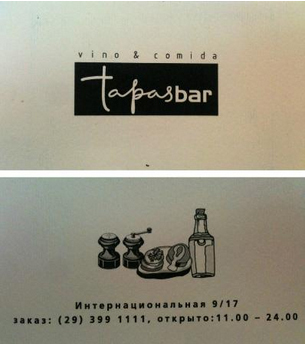 Onliner's "mystery guest" has visited the place and gives his verdict: for price over 849 thousand Belarusian rubbles he got gazpacho with giant dose of garlic and almost perfect steak. 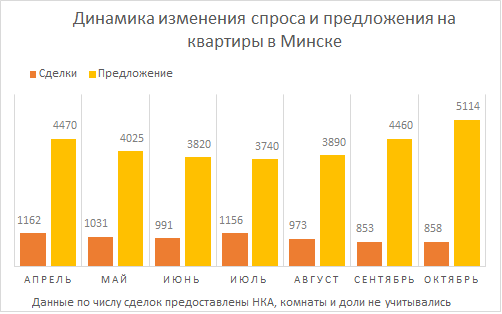 Traditionally, in the end of the year the popular electronic daily newspaper "Ezhednevnik" (The Daily One) ranks the most successful and influential businessmen in Belarus. The ranking is based on available commercial information as well as expert opinions. There might be some differences in estimation of wealth and influence of particular members of the list but in general the ranking gives true picture of "who is who" in Belarusian business. Now we present you first part of the list which includes people who are placed on positions 151-200. Recently government exchanged views on the current and future state of the economy with parliamentarians. The obvious conclusion – the situation is complicated. “This year was very difficult,” - said Belarus Prime Minister Mikhail Myasnikovich at the joint meeting of both houses of the National Assembly on November 22. But it’s too early to summarize. Basic economic regulations including Decree about indicators, budget and budget-laws must be adopted by the end of the year. 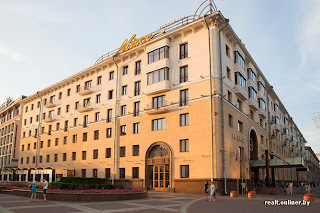 Hotel Minsk is definetely one of the most popular hotels in Minsk. 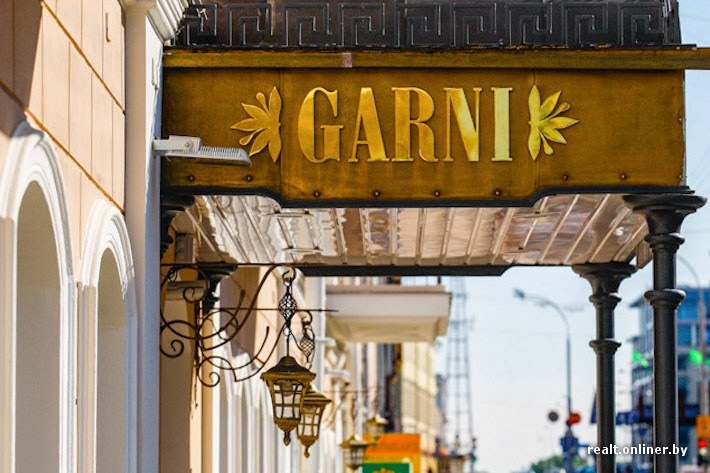 Indeed, being located near Independence Square and close to all "places to be" in Minsk this hotel is favoured by many foreign visitors. But is it staying there worth money the hotel charges its customers. This review will help to find out. Time to worry about savings in USD? 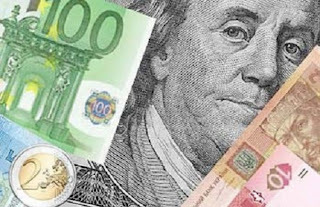 During autumn certain rumours have begun spreading in Belarus about possible ban on withdrawal of deposits in foreign currency from Belarusian banks. 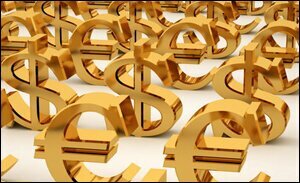 They appeared after the publication of the article in the govermental newpaper “Respublika”, in which the author wrote about the reasonability of the banks refusal of accepting deposits in foreign currency in general. People are also worried with current state of Belarus trade balance which has turned negative within last six month. Intergation of Ukraine with the EU will hurt its aviation industry. But Belarusian industry can benefit from the aggravation of relations between Russia and Ukraine after the latter's convergence with the EU. 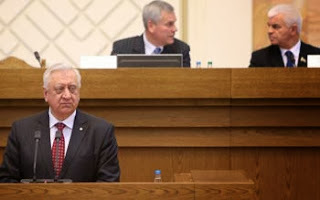 Not so long ago, in Belarus was on an official visit Prime Minister of Ukraine Mykola Azarov. According to him, one of the main purposes of his trip was to develop joint projects with Belarus in the field of industrial cooperation, including in the sphere of military-industrial complex. 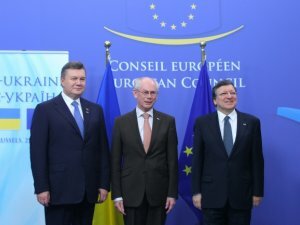 This announcement was seen by many experts as an attempt of the Ukrainian leadership to mitigate the negative consequences for the country of possible actions from Russia after signing an agreement with the EU on associate membership which Ukraine is planning to do next week in Vilnus. In September, the long-term growth of residential real estate in Minsk for the first time significantly slowed down . In mid-October we could see that was a turning point and since then we have observed only decline in prices. Reaction of buyers and sellers on trends and changes one can find in this October review of Realt.by. Against the background of the incipient decline of supply of apartments, the most important and most expected rate in October was the number of contracts closed. The data show us that in October exodus of buyers from the market did not happen. Compared to September, the number of transactions is even slightly increased. At the same time, the volume of supply continued to rise by accelerated pace. Number of apartments for sale on market in October was 14.7% more than inlast month. And rate of growth of supply compared to September remained absolutely unchanged. The current ratio of these two main indicator shows that the market is fully recovered from the excessive demand and shortage of supply of apartments which we had been observing during recent month. First, buyers began paying more attention to the 2- room apartments - their share in the total has risen. Number of 1-room and 3 room apartments bought in October is less than ususal. Secondly, people are actively buying within the First transport ring area. High price does not scare buyers - the number of completed deals in the heart of the city has grown by half. During last two months numbers regarding real deals look pretty significant. Buyers, focusing on the growth of the supply of apartments in September and August, traded reluctantly. As a result, if the October average bid price remained virtually unchanged (+0.2%), the prices of actual transactions has gained 1.3% due to inertia. In the future , against the background of rapid growth in supply, increased competition for customers and a clear reduction of the people we hardly can expect a convergence of the two curves. On the primary market, developers have continued to raise prices in October (+1.5%) despite a clear signal of reversal on the secondary market. It is important to say that at the moment number of apartmemts in new buildings share which are completed, but not sold out, is a third more than the year before. 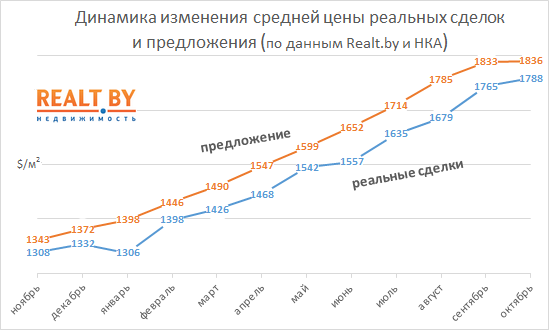 It should be noted that the growth recorded by real deals is mainly due to the already mentioned activity in the city center (number of luxury apartments sold in October is more than in September) as well as in the segment of 2- room apartments. 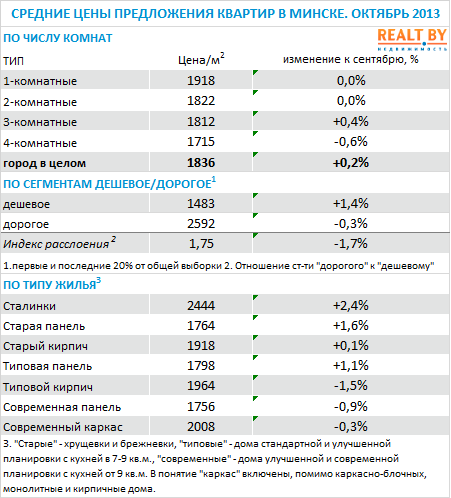 Average price sold od 2-room flats in October was higher than September's values ​​about 4.0% , despite the fact that for the remaining segments price growth has not exceeded 1 percent. The main feature of the dynamics of proposals for different segments on the secondary market is the growth of property prices in the old houses. 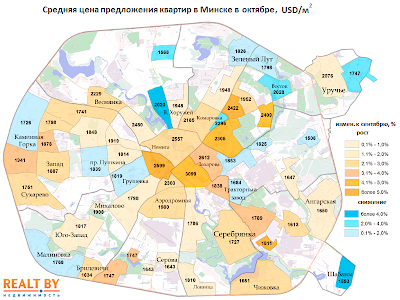 The maximum growth rates was recorded for buidings of Stalin era (+2.4 %), as well as apartments in panel Khrushchev and Brezhnev era houses (+1.6 %). In this modern cast-frame and brick home has decreased in value by 0.3 %, the same thing happened to the more affordable apartments in a modern prefabricated homes (-0.9 %). The color scheme of the price card has undergone a significant change over the last month. Most buyers in the center continues to hold there a positive price dynamics, while in many sleeping neighborhoods prices began to fall. Among them is the former city-wide leaders in the growth in the summer months: Kamennaya Gorka, Shabany and Malinovka. Three quarters of 2013 Minsk was the only "bright spot " on the map of Eastern Europe. None of the nearby capital city prices were not rising at the same pace. 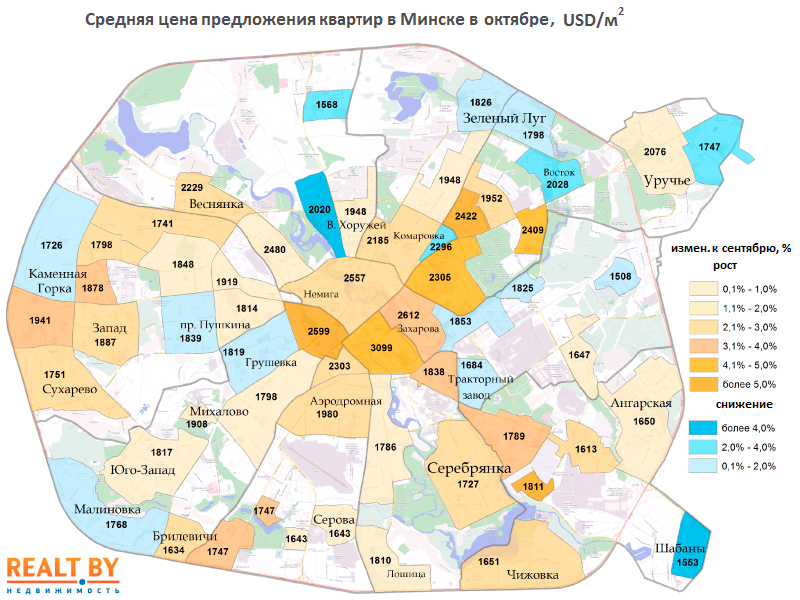 In autumn the situation began to change gradually: in the Belarusian capital prices have stopped and even started to decline, while almost all the neighbors experience, albeit a slow but growing rise in prices. However, the price of an apartment in Minsk still continues to be close to the maximum historical figure. Social networks users within only one day after Yana Kantsavenka, a stunning 21-old student of High School of Tourism, won a Miss Minsk 2013 beauty contest in Palace of Sport discovered various pictures of her doing thing that a lot of people would consider inappropriate for Miss Minsk. Moreover, other winners also appears to be involved in the scandal as some of them being a go-go dancer and a stripper. But official reaction from the organisers has yet to come. It is not always possible to get into any of Minsk swimming pools without doing some formalities first. Some of them require medical check to be allowed in, some are only for members. But if you want to do swimming just now there are some options available. Quite a few swimming pools in Minsk are open for everyone and do not ask papers. There are certain issues, of course. These swimming pools are pretty busy all the time so you should be prepared to swim along with many other people. Sometimes sessions in the pools are not available, and experience shows that the best time for swimming is lunch time. 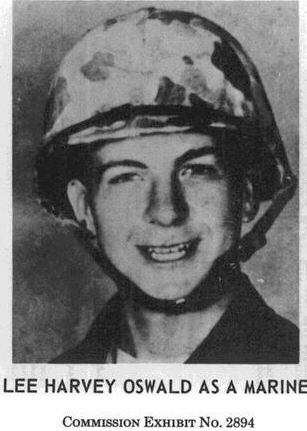 In October 1959, Lee Harvey Oswald, the only officially charged with the assassination of American President John F. Kennedy, went to the Soviet Union. The trip was well planned. Stating that his mother needed care, he left the army on September 11, 1959 and received a salary of $ 1500. 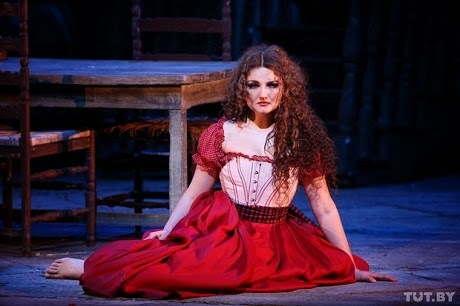 Festival of opera and ballet "Evenings of the Bolshoi Theatre at the Radziwill castle" will be held in Nyasvizh from 21 to 23 June. Almost immidiatelyy after nn June 28 the other art-fest "Ursula Radziwill' Theater" will take place. In the middle of the XVIII century, the Princess Urszula Radziwill founded a professional theater in her residence Nyasvizh, in which the audience watched opera and ballet performances. After almost three centuries the castle of Nyasvizh was chosen for a unique theater project. For recent years May on Minsk real estate market was the average standard month. 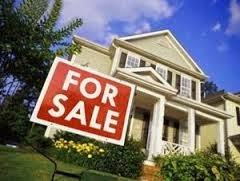 Most buyers are not in a hurry and at the same time activity does not fall sharply, as it happens in the summer months. The current May was no exception to this rule. Nevertheless, there were a few quite interesting events. 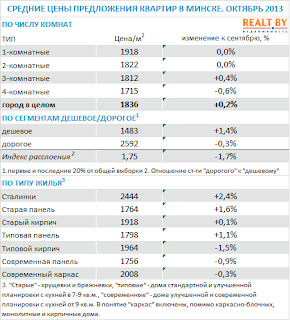 Facts and figures of the last month of spring in review of Realt.by. 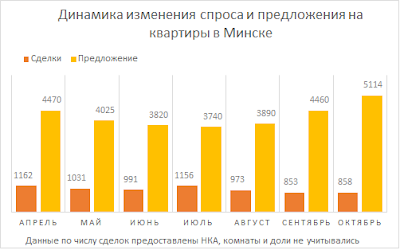 The increased demand for apartments in Minsk, which we are seeing the beginning of the year, continued in May. Although the total number of transactions compared to April decreased by almost 20%, the current mark is still a very high figure. 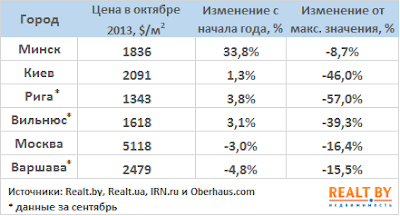 Number of apartments bought in Minsk this year is more than ever before. S & P upgrades Belarus to "positive"
Standard & Poor's rating agency has revised its outlook on Belarusian economics from "stable" to "positive", noting the continued stabilization of the economy. Ratings is affirmed to 'B / B'. 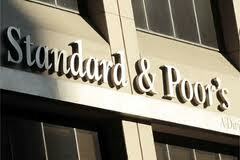 S & P experts point out that the government has tightened fiscal and monetary policies, which helped to stabilize the economy. "In our view, a further reduction in inflation and easing pressure on the exchange rate are the main signs of improvement in the economic situation in the country", - the company reports. In 2012, the Belarusian economic model has reached peak of its current capability. Now the only way to keep the economic growth without structural reforms and avoid collapse in the end of the year, such as currency crises as in 2009 or 2011, is attracting new borrowings from abroad. This has already been said openly by senior Belarusian officials. But lately, in Minsk did not succeed in the relationship with the creditors, not only in the West but also in the structures of the EuroAsian Economic Community (EAEC). What is the essence of the dispute and whether the parties will be able to agree? 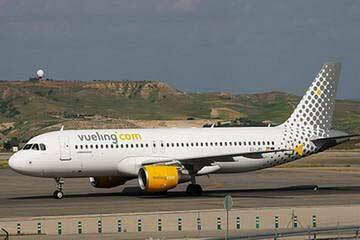 Vueling, a Spanish low cost airline is going to start flying to Minsk from Barselona during the summer season. 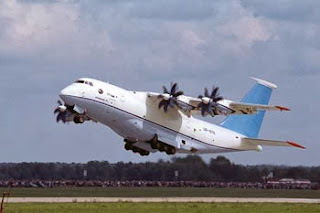 It is the very first time when a company which is positioning itself as a low cost airline begins flights to Minsk 2 Airport. Service operates on Sundays and will last till 15th of September 2013. Presumably, the aircraft will be Airbus A320. Like in the last season, Belarus Fashion Week will be running on two sites: the main runway will be at BelExpo exhibition center at Pobediteley, 14 and the additional program OFF SCHEDULE, designed to show works of young designers and the presentation of new brands which will be at Museum of the History of Minsk (Mikhail Savitsky Art Museum).